If Robin could eat one food for breakfast, lunch, and dinner it would be strawberries. She requests them every time she is hungry and prefers them cut in half with the “leafs” cut off. She can easily eat a half pound in one sitting, so we do try to limit her intake, but I pretty much buy a box or two every time we go to the grocery store. Lately our strawberries have been fantastic at the store, and on sale! To that end, I can make this coffee cake with things I have on hand. It comes together really quickly and has the perfect coffee cake texture and isn’t too sweet. You could really use any amount of strawberries you have – I used a 1lb carton with a few strawberries eaten out, but anywhere from half to a whole pound would work. I baked mine in a cast iron skillet and I’d recommend you do the same, just for rustic appeal and because you don’t have to worry about greasing it. 1. De-leaf and quarter the strawberries. Whisk the syrup, olive oil, and salt together in a small bowl and toss the strawberries in the mixture until they are coated. Spread the strawberries out on a baking sheet with parchment paper (unless you want to scrub strawberry goo off of your favorite cookie sheet) and bake for 40 minutes at 350. 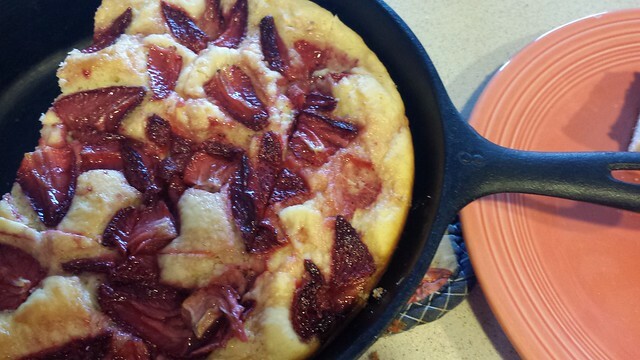 Stick your cast iron skillet underneath the pan to heat up while the strawberries roast. 2. Stir the flour, sugar, baking powder, and salt together in a mixing bowl. Whisk the eggs, buttermilk, melted butter, and almond extract together in a small bowl. Pour the wet ingredients into the dry ingredients and stir together until smooth. 3. When the strawberries are done, turn the oven up to 400. Melt the remaining T of butter in the bottom of the skillet and swirl it up the sides. Then pour the batter in the skillet. Spread the strawberries on top and return the skillet to the oven for 25 minutes or so. Allow the cake to cool in the skillet.